The far-right street movement PEGIDA on Monday called for a second straight day of protests in ex-communist eastern Germany after the alleged fatal stabbing of a German man by a foreigner. "Muster strength from anger and sadness! Only together can we ensure that his death was not pointless," said PEGIDA's Chemnitz and West Saxony regional chapter on Facebook in its call for a demonstration at 6:30 pm (1630 GMT), urging "more security through change". The call by the anti-migrant and Islamophobic movement linked to far-right party AfD came after police said a 35-year-old German national died in hospital following a "dispute between several people of different nationalities" in the city of Chemnitz. Two other men, aged 33 and 38, were hospitalised with severe injuries, police added. Police did not give further details of the dispute, but local media reported that a knife was used in the fight that took place on the sidelines of a street festival. News of the death sparked protests on Sunday, with a first gathering of around 100 people passing without incident. But police were later overwhelmed by a second demonstration of around 800 people at the city's Karl Marx monument. Police said they were forced to call in reinforcements as the crowd showed "no willingness to cooperate", with some even flinging bottles at officers. 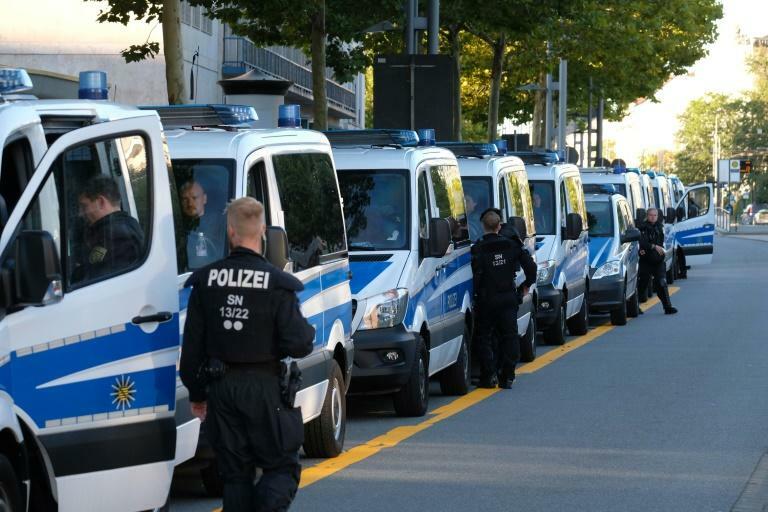 Several national media, including the Bild tabloid, reported that some demonstrators shouted "we are the people" and "get lost" at those they thought appeared to be migrants. Freelance journalist Johannes Grunert, who reports frequently on the far-right scene, told Spiegel Online he witnessed some protesters using bottles to attack foreign-looking people. "If I look at what has happened here on Sunday, I'm horrified," Chemnitz mayor Barbara Ludwig told regional broadcaster MDR. "The fact that people can agree to meet... run through town and threaten people is bad," she said. Saxony state is the birthplace of the PEGIDA movement, and misgivings run deep in the region against the arrival of more than a million asylum seekers since 2015. The anti-immigration AfD party enjoys strong support in the state, with polls showing that it could become the second biggest party in Saxony when regional polls are held there next year. In Chemnitz itself, the AfD has as many voters as the centre-right party of Chancellor Angela Merkel.